Most new production airplanes come with the digital electronic screens to display instrument indications. Most existing aircraft today are equipped with the older analog instruments with mechanical needle indications. Many older airplanes are now being retrofitted with new aftermarket digital glass panels. Most new glass cockpit airplanes are also equipped with some analog instruments as backups for their electronic screens. For these reasons, current flight students should be thoroughly trained on both types of instrument panels. In the Private, Instrument, Commercial or Flight instructor courses at American Air, you will receive approximately 80% of you flight training in a Cessna 172S with glass cockpit and the other 20% in a Cessna 172 with the analog panel. Upon completion of any of these courses, you will feel comfortable and competent with either type of instrument panel. The Cessna 172S is also equipped with XM weather display, traffic display and a fully-coupled autopilot. You will enjoy flying our state-of-the-art simulator with full-functioning controls. The simulator can be configured for a large variety of aircraft types – both single engine and twin engine. The simulator enables the instructor to set weather conditions and navigation situations to focus training practice in specific areas as needed. The instructor can also replay your flight path on the console chart and make a print out for you to take home and study. The instructor can setup conditions such as gusty crosswind landings, turbulence, low clouds, reduced visibility, equipment failure and more. The simulator can be “frozen” in flight to ask questions or to have ground discussion on the procedure in progress. From the instructor console, your instructor can safely initiate aircraft malfunction scenarios that would be unsafe to perform in a real aircraft. This gives you great “hands-on” experience in a safe training environment. If you have a flight lesson scheduled and the weather is unsafe, you may be able to complete the lesson in the simulator. Learning all of the complex functions of the switches and buttons in a glass cockpit airplane requires focus and repeated “hands on” practice. At American Air, you can do a lot of this practice in the Cessna 172S on the ground. We can plug in power to the airplane on the ramp and operate all of the cockpit systems. This makes the airplane a realistic simulator. You can operate all of the switches and buttons and see the proper instrument indications without having to fly the airplane or run the engine. You can comfortably focus on the cockpit procedures without distraction and at a significantly lower cost. You can take advantage of this valuable training opportunity anytime. This is a great use of time when the weather is down. Our aircraft are equipped with the latest video recording equipment to provide an audio and video recording of your flights in High Definition. After a flight lesson, your instructor can go over your flight performance with helpful suggestions on improving your skills. You will also get a flash drive copy to take home and review. This is an excellent training aid that is fun to use. Students can use an iPad in any of our aircraft and display traffic, geo-referenced moving maps with weather overlays and weather text reports. This greatly enhances safety and situational awareness. The common method of providing the required flight training on short and soft field takeoffs and landings is to practice on a longer, paved runway and pretend it is short and soft. At American Air, you will also get to train at an actual short grass runway airport to get valuable real life experience. Most schools do not provide this opportunity. Even if you do not plan to use this type of airport, you might have to land at one in an emergency. If an emergency forces you to land at one of these locations, you want to have the confidence in knowing you have the experience and skill to do it right. All of our students have also found this to be a lot of fun! Our syllabus calls for extensive ground training on trip planning with thorough weather analysis and aeronautical decision-making (ADM). During these exercises, you and your instructor will choose a trip to plan, retrieve all of the appropriate weather data and analyze the information. Then, decisions are made on whether the trip can be conducted safely. You will also determine what altitude, route and time of day would be safest. Since these important exercises are required training in our courses, it is preferable to spend the ground time on them when the weather prevents you from flying. Another option during a bad weather day may be to use the power plug-in to the Piper Archer III to practice the glass cockpit procedures, using the airplane on the ground as a procedures simulator. With all of these backup plans available, you will rarely have a lesson cancelled. You can keep moving forward toward the finish line while staying engaged and proficient during the process. In any pilot course, thorough ground training from an experienced instructor is essential to becoming a knowledgeable and safe pilot. Many schools substitute home-study or videos for ground school. This is adequate for preparing for the FAA knowledge test but, unfortunately, the knowledge test only covers about 50% of the information you need to know and mostly at just the rote level. This is primarily textbook information. The FAA textbooks and knowledge tests are quite often outdated in the scope of information they cover. Some of the information on the FAA test is no longer used and some current and relevant information is not yet included. In reality, flying is quite often something other than textbook in nature. You need to learn the why, how, where and when of each procedure and theory. Having this level of understanding, you can figure out solutions to problems you encounter in flight that aren’t covered in the textbook. Some schools do conduct a quick test-prep ground school, usually on one or two weekends. This type of ground school only teaches you the test. At American Air, you will receive thorough ground training that covers the other 50% of information you need to know to be safe that isn’t covered adequately in books and videos. You will also get to ask your instructor as many questions as you like while you are learning. This isn’t possible if you are watching a video or reading a book at home. Armed with all the knowledge you will gain in ground school at American Air, you will feel very confident and comfortable and enjoy your flying a lot more. Some of the ground school sessions can be taken one-on-one online live with your instructor – Steve Shaner using Skype. This option provides more convenience for those who travel or can’t get away from the office. Our ground school classroom is designed for effective presentations using the latest audio/visual equipment. In our classroom, you will enjoy the comfort of padded high-back chairs and experience state-of-the-art learning through the use of numerous training aids. The flight operations office at American Air is equipped with a ground-to-air base station communications radio with a large, high-mounted antenna. This enables communication between the instructor on the ground and students out on solo practice flights up to 50 miles out. We also supervise student solo cross country flights online in real time, viewing the position, altitude and speed of the flight live online. Observer student flights – informative, fun, and free! When you enroll for pilot training at American Air, you are eligible to ride along with other students as they train in flight. All students typically choose to participate in this program and take turns watching each other train. This is not mandatory and is only done with the mutual consent of both students on the flight. You can ride in the back seat while another student is receiving flight training. During this flight, you can observe all of the flight procedures as you hear the instructor and air traffic control through your headset plugged into the aircraft intercom. You can refer to your own checklist copy and follow along through all of the steps. You can unfold your aeronautical navigation chart or use your iPad app to practice navigating during the flight. You can learn a lot on this flight without the distraction of having to fly the airplane at the same time and, it’s FREE! This is done with the agreement that the other student can ride along on some of your lessons. The student taking the lesson can practice giving the observer student a passenger briefing. Flights with observer students onboard also provide the student at the controls with experience in flying the airplane with heavier loads. These flights are an excellent learning opportunity for both the student who is flying and the student who is observing. Over the years we have found that the flight procedure checklists available for airplanes from the manufacturer and other commercial checklist sources are woefully inadequate. They lack several important steps and proper order and organization. A comprehensive, well-thought-out checklist can make flight training easier, safer and more efficient. We have authored and revised the checklists for each of our airplanes and you will receive a copy of it for study and practice in our courses. If you are receiving checkout training in your own aircraft, we write a new customized checklist for your airplane and the equipment installed in it. At American Air, you will also receive a large course supplement binder filled with our unique handout materials that make learning easier and more enjoyable. These materials are constantly updated and improved. When you enroll in your flight training course at American Air, you can purchase all of your books and training materials at our school. You don’t have to drive to other pilot supply shops or order on line from different suppliers and wait for delivery. As aeronautical charts expire, you can get the latest, up-to-date charts right here where you fly. In addition to this great convenience, you can save 10% off the cost of your supplies when you join our Top Flight Flying club. If you are considering purchasing an airplane during or after your flight training, Steve Shaner can provide you with comprehensive information and advice. Steve can match aircraft types to your typical flight missions, advise you of the pluses and minuses of each aircraft type and go over the operational costs associated with airplanes you are considering. Steve can also point you toward the right companies for financing and insurance. Most of the students who choose American Air are high-level corporate executives, law firm partners, doctors, business owners and other highly–educated and active business professionals. Many of our clients researched all of the other schools in the area and decided that AAFT provided the highest level of safety and quality and the best return on their financial investment. Some of our clients transferred to AAFT from other schools because they were seeking higher training standards. These men and women have a lot in common and they often develop new friendships and business contacts while enjoying their flight training at American Air. We have also provided training to youths who want to pursue a career education in aviation. Some people who have retired have successfully trained here as well. We have trained many people over the years from age 12 to age 78. We have also provided supplemental flight and ground training to some of the spouses or companions of our students who want to be able to assist in flying if needed. Some students choose to study in groups, share training experiences and offer help and support to each other. We have an interesting mix of men and women, young and old, career pilots, recreational pilots, wheelchair pilots and people who just love aviation. Even though the training at American Air is organized and structured with high standards for teaching and testing, we make sure that each flight is a fun and interesting adventure. You will have exciting flights and see wonderful sites as you learn the skills to safely fly the airplane. You will enjoy the ground training and comradery with other students as well. We work hard to make sure each visit to our school is a wonderful experience for you! Using our online system, you may view the schedule availability of your flight instructor and the aircraft fleet anytime. You can reserve, cancel or change a rental aircraft reservation for a trip from your home, office or iPhone, 24-7. After completing the Private Pilot course, you may rent the Cessna 172s, or check out in higher performance aircraft and fly your passengers on trips for business or pleasure. At American Air, students and pilots can also rent our simulator and headsets. 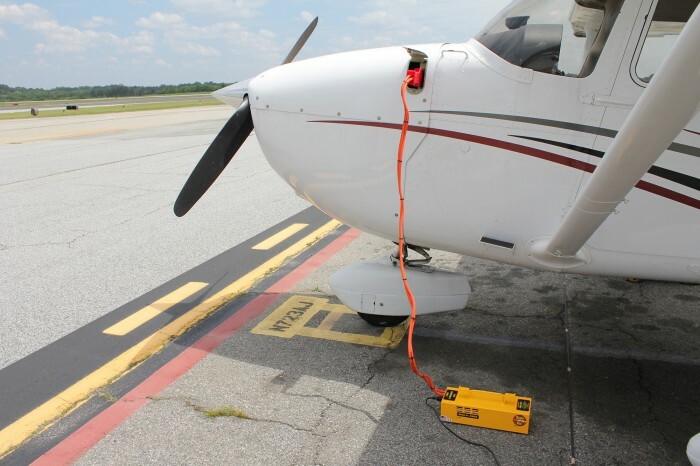 You can also rent the use of the Cessna 172 plugged into electrical power on the ground for glass cockpit procedures practice at less than half the normal aircraft flight rental rate.